Her list of accolades is nearly as long as the distance she can throw. She’s broken numerous records, and highlights from her college track and field career include 13-time conference champion, 16-time all-conference honoree and qualifying for the NCAA East Preliminary round for four consecutive years. However, the Atlantic Sun record-holder came from humble beginnings, and readily shares her story. “I feel like my upbringing has a lot to do with who I am today,” she said. Clark now works as a graduate assistant alongside JU Athletic Director Alex Ricker-Gilbert and his staff, after having spent the summer as an intern with KPMG doing auditing work. Despite her many successes both on and off the field, she doesn’t forget the challenge of her younger years, raised in a single-parent home affected by drug addiction and lack of resources. Clark credits many people who had a profound impact on the path she walks today. With five brothers and one sister, life was hard growing up. Her older sister, Katrina Morris, was integral to lifting Clark and her siblings out of a cycle of hopelessness, and continues to demonstrate to her younger sister how to rely on her faith. Morris took responsibility for Clark when her mother was unable, and the two still pray together most mornings around 5:30. It was Morris who moved 12-year-old Clark to Georgia, and it was Kevin Morris, Clark’s oldest brother, who became a significant father figure in her life. Her biological father was never very active in her life, and he died in 2012, leaving behind memories of abuse and neglect. Coach Rome picked up Clark every morning for school, carpooled back and forth to basketball practices, and made sure Clark had a ride to every tournament. At that point, Clark’s mother had turned her life around and joined the rest of the family in Georgia, but the family still didn’t own a car. Coach Rome filled that transportation need, along with providing daily encouragement and wisdom. Mark Lester is another coach Clark describes as a mentor for her on her journey. He helped out over summers and assisted with recruiting efforts at her high school. He played a pivotal role in Clark’s placement at JU, sending a grainy video of Clark at basketball practice, made on his phone. That recording eventually ended up in Coach Carson’s inbox. But Carson took the video very seriously, because it clearly demonstrated Clark’s raw talent. Her senior year, with no offers coming through for basketball, was a turning point. Instead, schools began calling her about track and field. Confused about what she loved and what was best for her future, Clark re-thought her plan to play ball at a state school. In short, she was leaning toward forgetting sports altogether and taking advantage of Georgia’s HOPE scholarship. Soon she was having track and field discussions with a university in southeastern Alabama. But after much hope and time invested, university representatives finally told Clark her distances would do no better than a 30 percent scholarship, despite her promising academic record. With that recommendation, Clark was determined not to pick up the phone the next time it rang. That didn’t stop Coach Carson or Coach Ron Grigg, Track & Field and Cross-Country Director at JU. Clark gives all the credit to God, saying there was no other explanation for her answering the phone the day Carson called about the video. Carson was looking for a complement to the talent of Samantha Turner, who had been signed months earlier. Conversations ensued, and an invitation was extended, despite a lack of track and field training. “I’m looking around, like, is this real?” Clark says. Though it came as a pleasant surprise to her, Carson recognized her potential all along. Without a doubt, the coach said, she wanted Clark at JU. “I was going to help her go wherever,” Carson said, even if she chose to attend elsewhere. It was the University’s personal attention that drew Clark’s interest, and that sincerity and attitude ultimately attracted her to JU’s athletic department. “I feel like JU breeds success … and they care,” Clark said. “I think I would have loved it regardless,” she added, but notes that meeting Carson and Grigg sealed the deal. 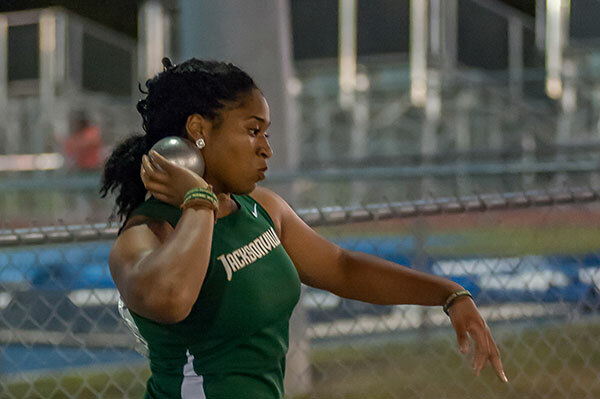 “We got lucky with Kree,” said Grigg, who counts her among JU’s best athletes. A much later encounter with the same recruiter from the southeastern Alabama school has become a source of irony and ribbing. 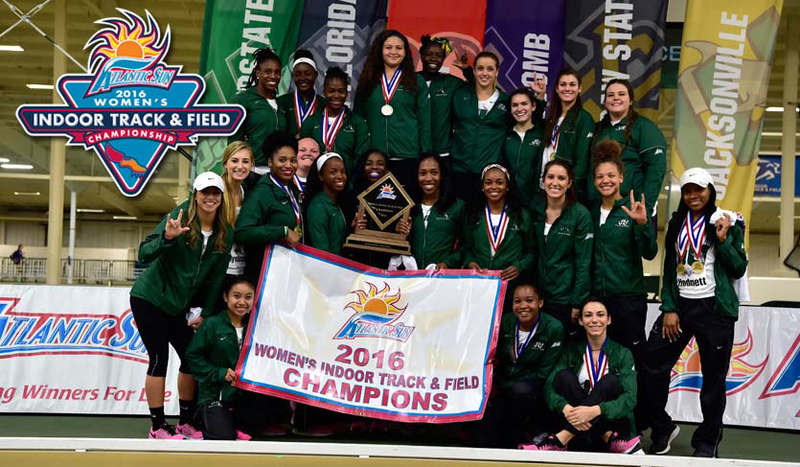 In a meet during her freshman year at JU, the recruiter was there coaching his own track and field team. He walked up to Coach Carson and said he had no idea Clark would perform so well. He was shocked, but Carson and Clark smiled, knowing she was exactly where she needed to be. Grigg, along with massage therapist Tom Moody, praises Clark’s natural ability to juggle many things at once. From a training standpoint, Grigg says track and field is like a three-ring circus, with athletes working in individual spheres, whether it’s running, jumping, throwing, etc. “Kree happened to bring it all to the table,” he said. She crossed traditional boundaries, encouraged teammates in separate events, and upped the ante on academic accomplishment across the board. “She’s just starting to touch her potential,” Moody said. Carson calls Clark’s unique blend of qualities the “it” factor: something not quite quantifiable yet unmistakable. 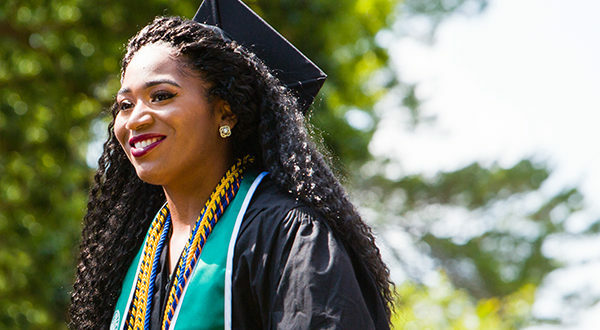 It might be what’s led to her 3.89 GPA, membership in the Phi Kappa Phi Honor Society, being ranked fifth in the region in discus, and her preparation for the 2020 Olympic qualifiers. 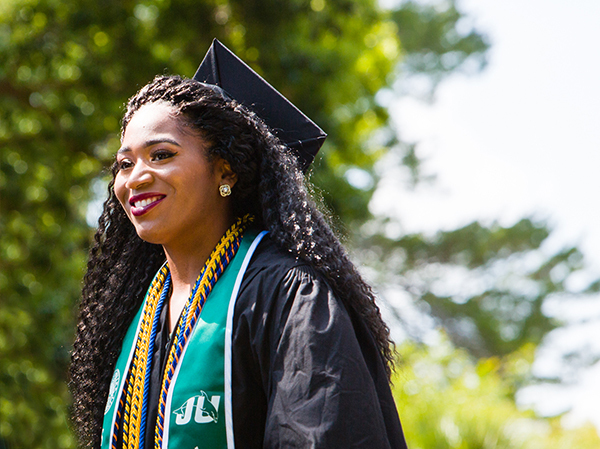 It may well be that her work as a graduate assistant and earning a master’s degree won’t be the last JU sees of Kree Clark. She’s envisioned her dream job: to travel the nation as a motivational speaker, life coach and nonprofit leader. She said she wants to give back, like her sister Katrina, Coach Rome, Bambi Carson and Linda Glover, the mother of Clark’s best friend, Nyesha. The women she’s met along the way, who cared enough to make an impact—her teachers at Booker T. Washington, fellow JU students, even a nameless woman back in Dover who regularly appeared at her mother’s door to check on Clark—their lives are worth emulating. Establishing a nonprofit organization in support of women and girls may be a part of Clark’s future. Regardless, nothing will stop her from sharing the same life-altering support she received as a girl and a young woman.